There’s nothing quite like sitting with 3-D glasses on over your actual glasses in the first row of a packed movie theater, popcorn already between the seats and fussy kids being placated by their parents. But when the music started, everyone cheered. Yup, I was watching “Stars Wars: The Last Jedi” the day after it came out in theaters (best/worst decision?). Admittedly, I’m a sci-fi nerd and had been looking forward to the film, but I wasn’t expecting to get so emotional — or to find myself thinking about my mother. But there I was, overly-sized soda and all, suddenly faced with a lot of feelings. What makes this particular “Star Wars” movie so monumental, besides the fact that the main character is a woman (finally), is that it’s Carrie Fisher’s last role — a role she played alongside her daughter, Billie Lourd. Fisher, of course, reprised her role as Princess Leia, while Lourd played Lieutenant Connix in the Resistance. It’s powerful to see a real-life mother-daughter duo play strong women together on the big screen, but even more so after Carrie Fisher’s tragic death almost one year ago. In general, “The Last Jedi” had some pretty epic girl power moments (hi, Laura Dern), which for me, meant a lot to see in a post-#MeToo world where women and femme voices are sorely needed in order to change toxic masculinity, make the workplace more women and parent-friendly, and decrease sexual assault and harassment. But for me, it was also much, much more personal. A few months ago, my mother and I stopped talking. We weren’t speaking for about four months, from Mother’s Day until this past September. My relationship with my mother, as I’ve written about, has been strained and tumultuous at times, largely as a result of our different political and social opinions (we kind of fit all the clichés: I’m the rebellious artistic daughter; my mother is the more conservative baby boomer). During that time, we were both angry and hurt, but unable to necessarily voice these feelings in a way that benefitted both of us. That break, however painful, turned out to be the best thing that could have ever happened to us. 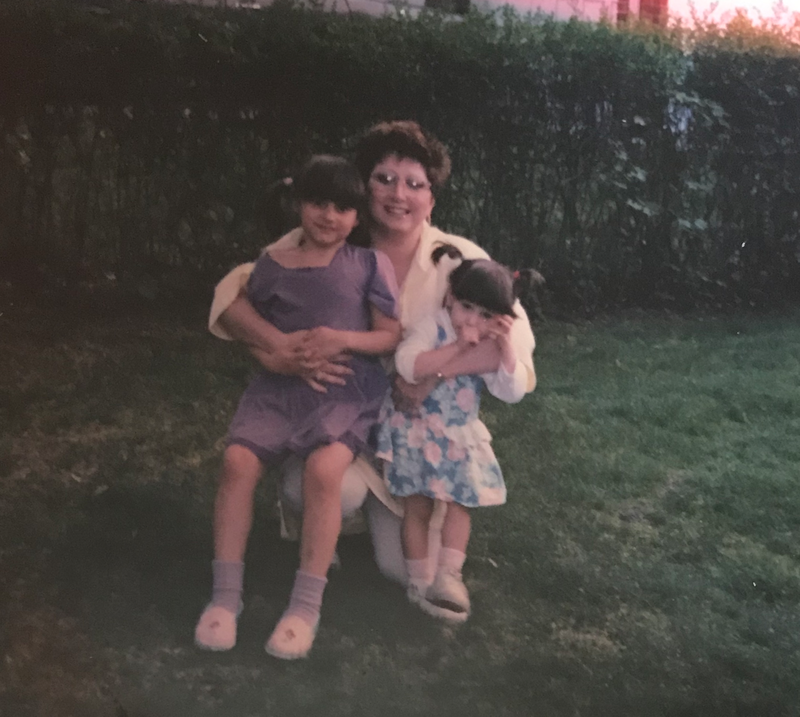 When I started speaking to my mother again on her birthday in September, it felt as if no time had passed at all — the absence didn’t leave a cold bitter void, but rather allowed a fresh new start full of warmth and hope. When I heard her voice on the phone, how happy she was to hear from me, the happy tears she was crying, there was a feeling in the pit of my stomach. Instead of dread, it was joy for being able to make her happy, but to also know she was actually seeing me for me, instead of a version of a daughter she expected but didn’t get. When she said, somewhat rushed, “I just want to forget what happened, just move on,” I couldn’t agree more. So we did. I’m the one in pigtails. Which brings to me now, several months later, when I saw Carrie Fisher’s face on the big screen, along with her daughter’s. I suddenly thought about my own mother — and her mortality. It felt as if time was constricting all around me. It was definitely not the first time, but it was a moment in which I felt so aware, and acutely grateful, of the fact that arguments between family are just not worth it. Holding onto pride is a silly, useless emotion, especially in the face of loss. What if something had happened to my mother while we weren’t speaking? The clichéd phrase, “I’d never forgive myself,” rang so true to me in that moment. And it’s a real fear for me: My mother has health conditions that do make her life harder, that do make this fear even more of a reality. While we weren’t talking, my mom had an angiogram, and while the results came back showing no blockages, it could have just as easily been bad news. Regardless of whether a death in the family is expected or not, the outcome is just as devastating. Seeing Carrie Fisher and Billie Lourd together made me realize, more than ever, that I need to savor these moments I have. I can’t see the future. I don’t know what’s in store for me, or my mom, or for us as a collective people. I can’t control what happens, but I can control how I react, how I decide to do what I can with the time I have. It seems like a waste not to use that time wisely, and by wisely, I mean loving the people around me the best way I can. And you know, by wearing 3-D glasses like the nerd I am.